Extruders are used for the continuous forming of products. 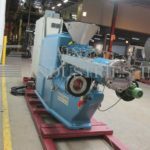 Extruders take a mass of product and forces the product through a former, often called a die plate, to create the proper form in the extruded product. The extruder uses a mechanism, usually a single screw or counter rotating double screws, to work the product together and pushes the product forward with enough force to push the mass of product through the forming die plate. Extruder barrels (the area where the screw processes the product) are often jacketed to maintain a specific heat for the process. Forming die plates are specific to the product that is being formed. The ability to form and shape products and provide consistency make extruders an important piece of equipment for many industries. Werner, automatic, dual counter rotating roll, dough sheeter / extruder with amount of product per hour – depending on materials and application. Equipped with 24" long x 13" wide x 8" deep product hopper, (2) 8" OD x 24" long rollers, manual gap adjustment, hinged rear roll design, rotary die brush, direct gear drive, differential speed cylindrical rolls, open frame design and a 94" long x 24" wide product conveyor, with on / off push button controls and vari speed controllers. Mounted on heavy duty base frame. Single screw extruder rated up to 120 lbs per hour – depending on materials and application. Equipped with 100% jacketed for both water or steam with temperature range of -85 deg F up to 550 deg F and temperture is precisely controlled in each zone of hollow sectionalized jacketed barrels (40" Long) with a 2-1/2" diameter screw. The liners are made of hardened stainless steel with all smooth interiors. Variable speed with extrusion pressures ranging from 100 psi up to 5,000 psi. This is a cooking extruder which continuously cooks pre-mixed, semi moist and moist materials. Five zone extruder. Equipped with a stainless steel product hopper, flanged product in feed port, 1-1/4" diameter by 36" long stainless steel screw. Each zone is electrically heated (individual controlled to 800°F) and air cooled through copper tubing and fan system. L to D Ratio of 24:1. Variable speed drive up to 125rpm. Caster base. Variable speed counter rotating twin screw extruder. Equipped with two screws measuring 100mm (3.937") wide x 44" long. Features product infeed hopper into a 5"L x 5"W feed throat, five electrical heating zones, dual cooling zones into a heated transition head with a 60mm x 550mm opening. Unit has L/D ratio of 11:1, 60 rpm max shaft speed and vari speed drive. Co-rotating Twin screw, 57mm carbon steel compounding extruder with optional high torque drive rated at up to 350 kg/hour – depending on materials and application. L to D ratio 34:1 Equipped with 9 jacketed barrels in 7" long sections for heating and cooling, 3.5" diameter feed area with additional infeed area of 28" downstream from the first. OAD: (L) 186" x (W) 40" x (H) 78"
Hosokawa / Bepex / Hutt, Model FP 200 AA, automatic, rotary bar roller press with pounds of product per hour – depending on materials, application and machine configuration. Equipped with a 30" long x 5" wide x 19" deep jacketed product feed hopper and (2) 200mm diameter x 800mm long jacketed rollers. Control panel with push button start / stop controls. Mounted on (4) leg base frame. Polar Process, Model PP352HU3, stainless steel, twin screw extruder. Hopper dimensions: 12½" in Length; 7½" in Width; 9" in Depth. Equipped with two 3½" diameter x 26" long stainless steel screws and cross direction corrugated feed roller. 3½"OD / 3"ID Tri-clamp style discharge. Control panel with push button start/stop and touch pad speed controls. Mounted on a stainless steel base with locking casters. 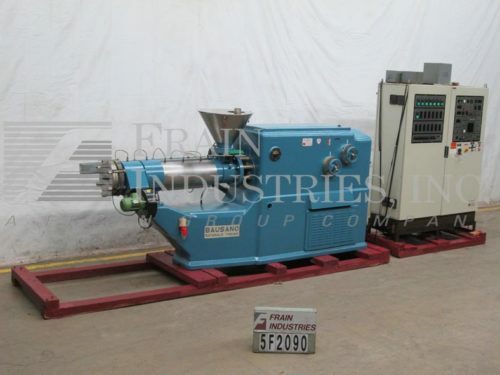 Sigma, Model LE-3D, duplex vacuum plodder/extruder. Capable of processing 40 kg/hr – depending on materials, application and machine configuration. Equipped with 13½" long x 12"wide x 8" deep stainless steel supply hopper with safety grid. Upper stage has 3" diameter x 12" long water cooled screw into a refining plate and vacuum chamber. Lower stage has 3" diameter x 12" long water cooled screw into a refining plate and electrically heated extrusion cone with 1¾" ID outlet with 30" ground clearance. Control panel with on / off switches for vacuum pump and heater and independent variable speed controls for upper and lower stage screws. Water cooling is supplied by (2) ½" NPT fittings. Single screw extruder will continuously cook 100 to 1,000 Lbs/Hr of grain & cereal based products depending on size, shape, & density required. Extruder is a 3.25"dia x 30" length w/ 6 heads (barrels), jacketed for hot water. System consists of Accurate 1-1/2 screw feeder to a Wenger dual 6" dia x 30"L SS conditioner w/ 1.5 HP drive, . Also has a Toshiba AC frequency inverter. Ideal barrel size for starch base products like cereal. Includes a Rotary knife cut-off that is hinged to swing away for clean-up. Benjamin Eastwood Co. stainless steel 4" screw soap plodder/extruder. Designed to refine/mix/homogenize the mixture of soap noodles, perfumes and color; or to extrude the ready to cut soap. Capable of processing 100kg/hr. Equipped with 14"L x 12"W x 10"deep stainless steel supply hopper with safety grid, stainless steel screw, 4"diameter x 18-1/2"L x 2"shaft diameter, jacketed screw housing (8"diameter x 10"long) to cool the machine with water inlet. Stainless steel extrusion cone with 3" diameter outlet. Powered by 2HP U.S. vari-drive motor with start/stop and reset buttons as well as a reverse/off/forward switch.